Our life depends on Fate, which drags us without compassion, sometimes hitting hard on our faces. In front of everyday difficulties and of the perspective of an indisputable death, happiness is a precious good, very difficult to be reached and to be preserved. In our society we live with the great misinterpretation that it is enough to “have” in order to be happy. The material goods ostentation or the show of our social position is confused with a happiness that is evanescent like a castle of paper, whenever the Fate brings us back to reality. Then, we remember the divinity, that was forgotten since a long time, but only to complain about the bad luck and to long for the past season of happiness. Or maybe there is a huge misunderstanding, maybe we should go back to the beginning and reprogram our way of thinking and the interpretation of our whole life. Maybe there is a sober way of living that can shield us from the inflexibility of Fate and that can provide us with the serenity of the Gods, to an inner harmony with the universe and the divinities, a way that can propose the ideal of the Pax Deorum at personal level. Well, such a way does exist, not only in the oriental wisdom of the Zen doctrine and of Buddhism in general, but here, in our land, in the Roman Tradition. This way was proposed by a philosophical school that became pragmatically Roman, with representatives like Seneca, Epictetus, and one of the best imperators of Rome: Marcus Aurelius. We are speaking about STOICISM, the ancient Roman way toward lasting happiness. Let’s go back to the previous article, when we were flying high in the ample spaces of the high metaphysics of Aristotle and Plato, while we were almost forgetting our everyday earthly condition. As a matter of fact, after the birth of Metaphysics with Plato and its affirmation with Aristotle, philosophy changed abruptly its route. Already Antisthenes, who was a follower of the Socratic method and a contemporary of Plato, argued with the latter, explaining that he could see horses but hardly any idea of horseness (ἵππον μεν ὁρῶ, ἱππότητα δε οὐχ ὁρῶ), in other words rejecting the world of forms. After Plato, philosophy changed its objectives also as a consequences of the new global order set up by Alexander the Great, where the Greek polis lost its meaning in the frame of the vastness of the new kingdoms. Greek citizens, that once were active part in the politic of the polis, became meaningless grains of sand in the immense world, hence losing their interest for politics and directing their attention to their individuals. The philosophy of this period, called Hellenistic, reflects the new needs of people: the principal three philosophical schools of that time, i.e. Cynicism, Epicureanism, and Stoicism, were not interested in politics, but in personal ethic and behavior, leaving the metaphysical quest, as it was considered useless for the necessity of people. The second navigation of Plato was abandoned in favor of a materialistic approach. After the death of Plato we need to wait till the half of the first centuries of the vulgar era to find a new progress in metaphysics, with Middle Platonism. Even though from a metaphysical point of view we could simply leap over the centuries dominated by the materialistic movements and start again from Numenius of Apamea, however it is interesting to stop by the Stoicism, for at least two reasons: first for its capability to understand the Roman nature and adapt itself to Roman pragmatism, second because in its late stage it was dialoguing with Middle Platonism, contributing to the formulation of henotheism, ethic and tranquility (today we would say mindfulness), which the very same Plotinus considered important in order to reach the contemplation of the One. Just to provide a historical frame, we remind that the founder of Stoicism was Zeno of Citium (336/335 – 263 BCE). He moved his attention from the metaphysical cosmology to the quest for a method to obtain the inner peace, using reason, or better LOGOS, to overcome the impact of the world events on the people and to control the destructive passions. He refused Plato’s second navigation and every transcendence and considered ideas as pure mental representations. In Stoicism there is no psychic dimension, so that everything is material, immanent, bodily: not only the whole universe with its stars, but also souls, and even gods and goddesses. Matter, however, is not the same as per the chaotic atomism, but on the contrary it is matter with order and aim (telos), impregnated with logos, the universal immanent mind, which gives rationality, divinity, life. According to the very ancient philosophy of Heraclitus, everything is divine for the presence of logos (pantheism), everything is alive for the logos (hylemorphism), all is unified through the logos. We human are privileged for the presence in us of logos’ sparks, which let us understand the universe we belong to. This is the base of Stoicism since the times of the ancient Stoa (so the first school was called, as the lesson were held under a portico, called in Greek stoa), and this has been preserved also during the Roman period. 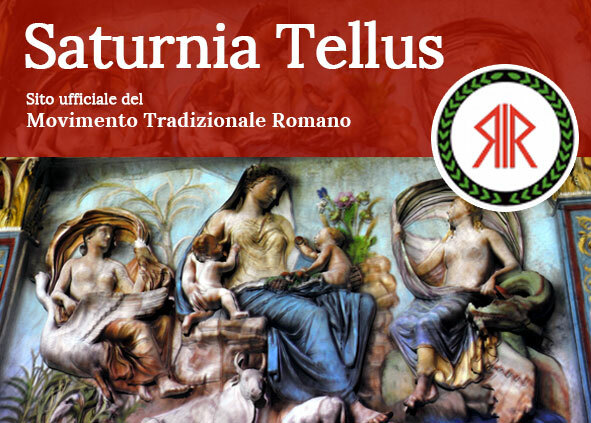 Roman Stoicism emphasized the moral meditation, accepted some religious principles and got influenced by Neoplatonism, to such an extent that the stoic philosopher and imperator Marcus Aurelius accepted the existence of a cosmic Nous, renouncing de facto to the original materialism. Stoicism does not accept metaphysics, nevertheless it tries to explain the knowledge mechanism and the ethical process by an interesting physical model. According to Stoicism, everything is material and everything contains logos. Hence, man can know everything as he share the same logos with the world. Knowledge has an empirical nature, and is acquired through senses. The soul is also material and has no innate ideas or representation but initially it is like a “tabula rasa”. The first step to know something is the perception (aisthesis), that is the impression of an object as passively perceived by the sense organs. 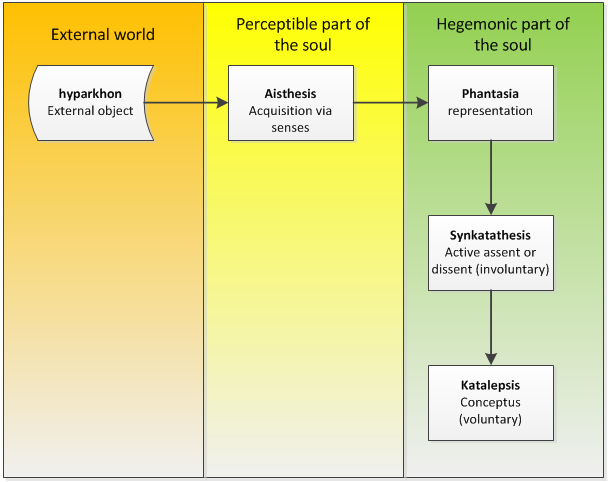 The perception is transmitted to the material soul as a representation (phantasia). A material imprint of the object is written on the soul. This imprint occurs in a more or less automatic way and depends on the object. Then we have to consider whether the received representation matches or not with the object. This step, which is driven by the logos in the soul, and that often occurs in an involuntary way, is the active assent or dissent (synkatathesis). By this step our logos controls the objective evidence of the representation. The voluntary part is the one which drives the ethic in Stoicism, although it is marginal in the process of knowledge. This parts occurs in the judgement of the representation, which can be of assent, dissent or suspension (judgement postponement). We are true when we assent the evidence and dissent the non-evidence, we are wrong when we assent the non-evidence and dissent the evidence. In other words, in order to be in the truth we need to accept the objectivity, otherwise we are dragged by it (Seneca used to say: uolentem fata ducunt, nolentem trahunt = fate accompanies whoever want it, and drags whoever does not want it). When we give the assent to a representation with objective characteristics, we have the apprehension (katalepsis) e the object becomes fully understandable (φαντασία καταληπτική or, according to Cicero, conceptus). An akataleptic representation on the other hand does not correspond to reality. Zeno compares the whole cognitive process with a set of position of the hand. The right hand, when open, symbolizes the representation; when the fingers are a little curled up, the hand symbolizes the assent; a fist represents the catalepsy; while the right fist firmly grasped by the left represents the knowledge of the wise. The original Greek stoicism used to consider society as something unworthy to deal with, mainly for the decline of politics in the Hellenistic word. Stoicism was introduced to Rome by Panaetius from Rhodes (around 185 – 109 BCE), who was frequenting the Scipionic circle. The Roman Stoicism resulted to be adapted to the Roman mentality, changing its content with respect the doctrine of Zenon and being later identified as Middle Stoicism. Probably the most peculiar change is related to its attitude toward society. If the crisis of the polis had caused the disinterest of people toward politics in favor of individual needs, Panaetius finds a victorious Rome with a full developing society, so that he gets convinced to recover the meaning of politics and reject the possibility to reach happiness through apathy, as suggested by the ancient sages. The acceptance of politics in the practice of Stoicism was developed through a reformulation of the concept of “action”. At the time of Zenon, there was a dichotomy in the vision of good and evil. According to the original doctrine, as nature is full of Logos, a life according nature coincides with a life according virtue and with the same happiness. The Stoic practitioner, whose ethic is driven by virtue, becomes self-sufficient and wins happiness, because virtue can influence every moral attitude, not only in the rational sphere but even in the subconscious. However only and exclusively an action toward virtue is effective. This kind of action is called katorthoma, or “perfect action” (κατόρθωμα, plural katorthomata) and is driven exclusively by reason, even at the risk of violating common morality. An action that goes against virtue is defined vice. All the rest of actions are considered irrelevant: the world is black or white with no grey in the middle. It is to remark that Stoicism does not value actions by their results, but by the intention they are carried on. A clear consequence of this approach is that no fool can perform a perfect action. In any case, the purist stoicism of the origins was not considering actions that were not in then sphere of the katorthòmata, but this stringency made the practice of Stoicism hardly viable. Later, Stoicism became more oriented toward normal life and considered also the actions that were not virtuous in absolute meaning but that were anyhow beneficial for everybody. These actions were defined kathèkon (καθῆκον, plural kathékonta). Beyond moral actions (virtuous or vicious), actions may have a relative value or disvalue if are related to the body. There are convenient actions or duties, and their opposite, inconvenient actions, and also indifferent actions. In this way stoicism started dealing with common actions. Panaetius introduces in Rome this new conception of action as he does not restrain his attention to perfect actions, but he considers also the intermediate actions, the kathekonta, emphasizing the interest for duties. He classifies virtues in two categories: the theoretical and the practical ones. A theoretical virtue is related to knowledge, or Sophia, and coincides with the knowledge of Logos. Practical virtues instead are fortitude, as the capability to stay on one’s own purposes; temperance, that is the capability to temper one’s passions by rationality; justice, as desire to preserve harmony with the community and the state. The latter is introduced in stoic philosophy as a Roman innovation with respect to the original Stoa doctrine, providing a partial retrieval of the moral themes of the polis. The sense of harmony is not bounded anymore to what is strictly natural, but also to the right relation of the individual with the State and its laws. In this way duty is introduced among values. Duty is very important in the Roman way, as the happiness of the citizen requires also the fulfilment of the duties of a citizen, for belonging to a society. Stoicism during its late stage received some Medio-Platonic concepts. The stoic philosopher Musonius introduces the concept of man in the divine image and explains that practicing philosophy means to worship Jupiter, anticipating the Neoplatonic aim of divine assimilation through imitation. A hundred pages would not be enough to describe even superficially the treasure of the stoic Roman philosophers as Seneca, Musonius, Epictetus, Marcus Aurelius and others. Philosophy abandons the abstraction and becomes a medicine for the soul. According to Seneca, the abstract problems of philosophy do not help us to be virtuous but just to be learned, while only a path of simplicity can lead us to wisdom. Happiness, even when difficult to obtain, can be achieved by a living based on nature in interior harmony with the world. A happy man is the master and maker of his own life, because he remains unperturbed by external events, as he is based only on himself and on his capabilities, and he is ready to bear all the consequences of his actions. Therefore, happiness is not the fruit of virtue, but corresponds to the very same virtue. The last stoic philosopher of the Roman world was Marcus Aurelius (26th April 121– 17th March 180 CE), one of the greatest emperors of Rome. He practiced stoicism in an adogmatic and eclectic form, embracing some concepts from Medio-Platonism, from Epicureanism and also from Skepticism, following a moral philosophy with high religious references. An important point in Marcus’ philosophy is the transience of world. The whole world with its continuous transformation is worth nothing to the wise. The wise learns through philosophy how to get the right meaning of everything and also to give little importance to the temporary rules we are playing during our life. Everybody has his own duty, who was born slave, who noble. But the wise can distinguish between the emptiness of the role that he is playing and the ethical meaning to carry on his own duty with a stoic responsibility. The meaning of life is given by the One-All (retrieved one century later by Plotinus), the source that redeems every individual from the nothingness. Under an ethical and anthropological perspective, the moral duty offers the meaning of life. It is evident that with Marcus the stoic materialism loses the original dogmatism in favor of an ethic valid for everyday life, even though it maintains part of the original physics. Our emperor used to say: If you grieve for some external object, actually it is not the object itself to cause distress, but your way to judge it. These words are coherent with the katalepsis and are valid still today. The Emperor of Rome, considering his power position as accessory in comparison to the meaning of life, is speaking to us from the past, not like an oriental king, out of reach in his golden throne, but like a Pater Familias sitting at the dining hall with his family. Not like a worn garment, but like a human being. A real human being. The lesson of the Stoa is to be remembered.